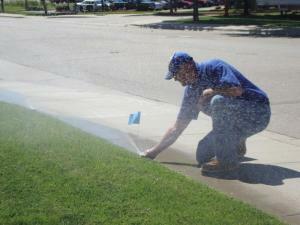 Like any system in your home, irrigation systems need repairs from time-to-time. From aging parts and accidental damages to Mother Nature and misuse, we will assess the problem and repair it quickly. Whether your irrigation system was installed by Valiant Irrigation or another provider, we will thoroughly inspect your system to properly identify the needed repairs. We’ll provide you will a detailed report and answer any questions you may have prior to beginning the repair. Please note: If you experience a break in your line, turn off the water at the back flow and call us at 270-227-2828.